It's almost time for that most sacred of holiday traditions. The one where you sweep up pine needles for the next six months. It's not an entirely avoidable situation, but you can mitigate the annual disaster by taking steps to keep your Christmas tree fresh and vibrant. Here are a few tips that will make your Christmas tree the envy of dendrophiles and people who settled for an artificial tree. You want to start with a fresh tree. 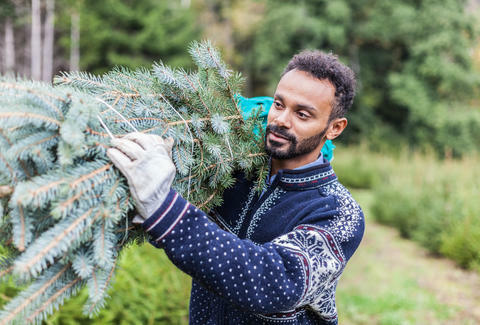 If you aren't cutting it down yourself, Marsha Gray, Director of Communications at the National Christmas Tree Association (NCTA), recommends this test. "Gently draw your hand down a branch," she says. "If a few needles come away, that is fine. If quite a few needles come off, particularly green needles, that tree may be dry and you may want to select another." Additionally, with the NCTA projecting a Christmas Tree shortage, buy early may increase your chances of getting a fresh one. 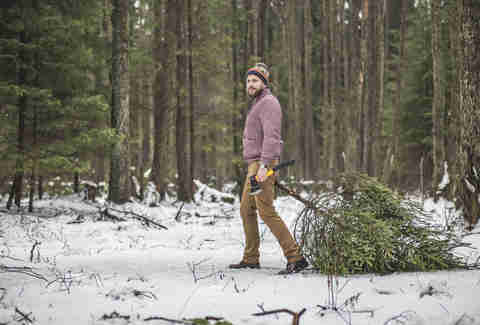 Once you've picked that perfect fir, get a fresh cut on the base of the tree. The place you buy your tree should do it for you. Gray says getting a half-inch off the bottom should do the trick. A 2010 study from the University of Wisconsin-Stevens Point showed that watering a dead tree isn't as absurd as it sounds when you say it out loud. Get your tree in water as soon as you get home, and make sure you're giving it water every day. "We recommend a quart of water for each inch of diameter of the trunk," Gray says. She also suggests that you may want to water it twice a day for the first few days it's in the home. Though, there are a lot of different bases available. At a minimum, make sure the water line is above the base of the tree and that it never drops below the base. There is a pervasive belief that you should mix a tablespoon of sugar into the tree's water. (Others recommend aspirin or even vodka.) However, there's not much science backing the claim that this will help your tree stay fresh. The author of that 2010 study, tree scientist Les Werner, told the Milwaukee Journal Sentinel, "Clean water still works the best." That's a view shared by most research. Setting up your tree far from sources of heat can help prevent it from drying out as well. That means positioning it away from heaters, radiators, or fireplaces. Gray says even a sunny window spot can make a tree dry out. How Long Will a Christmas Tree Last? There's not an easy answer to this question. Most retailers say about four weeks. It's hard to say because different types of trees have different lifespans. Additionally, it matters how fresh the tree is when you purchase it. Moreover, doing all the things above can make a difference. For instance, in the video above, the Christmas Tree Truck did a time lapse of a tree that still looks good after 30 days. They write that this tree was properly cared for and kept out of direct sunlight. If you do all of these things, you should be on your way to having a healthier, longer-lasting Christmas tree.